A couple of years ago, I came to the conclusion that the Bermondsey Beer Mile had lost its appeal. It had jumped the shark, a victim of its own success. The Kernel had closed its drinking area, and the other brewery taps were often overwhelmed – some, like Partizan, had a bar but little seating space. What a difference those two years have made. OK, even on a freezing day in February, respected and well known places such as Brew By Numbers and Anspach & Hobday still get busy, and Eebria – one of the newer bars – was so rammed I didn't even bother trying to get served. Apart from that, and despite the many groups of people strolling from venue to venue, it mostly felt comfortable. The overall story is expansion – existing breweries moving and growing, new ones moving in, more beer retailers, and so on. At the eastern end, Fourpure has taken over into the industrial unit next door. This has added a lot of production and workspace for them, but has also allowed the taproom to expand, with more seating space and a new bar. They also now have a proper spacious indoor toilet block, which highlights just how shamefully dismal are the loos in pretty much every other local brewery and bar. Heading west, Partizan’s move to a new and much bigger site, with both indoor and outdoor seating, was long overdue. 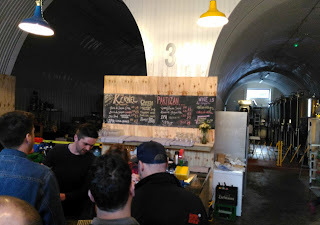 Being an industrial building, the taproom might be a bit overly echoey and noisy for some, but it has much more space and a bigger bar (right) with guest taps too – when I visited, there were several Kernel beers on. The move also freed up two railway arches on Almond Road, making room for not one but two new breweries. 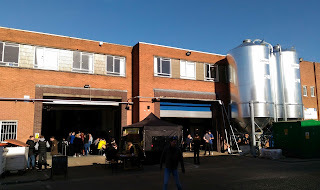 Well, one isn’t totally new – the highly experimental Affinity Brew Co moved down from Tottenham. And the other, Spartan Brewery, isn’t totally a brewery as it doesn’t yet have its brewkit in (they’re brewing up the road at Ubrew for now). 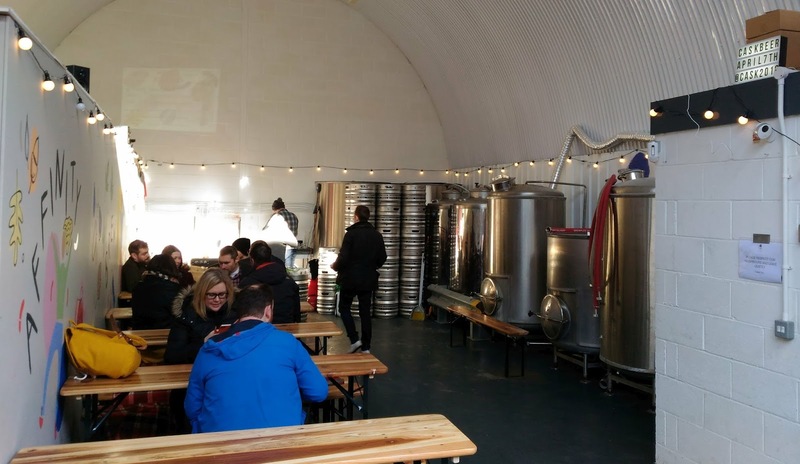 To make it even better, while the other breweries on the Mile – with the notable exception of Southwark – are keg-focused for their draught beers, both these new ones plan to package a significant proportion in cask. Sadly, neither had cask on when I visited, although Spartan co-founder Colin Brooks said he’d like cask to eventually become the majority of their production, and they’ll have casks at London Drinker Beer Festival next month. Meanwhile, Affinity (left) is organising a weekend Bermondsey cask beer festival for April 7th-8th. Co-hosted by Partizan, this will feature 30 breweries from up and down the country, each brewery supplying two different casks, one for Saturday and the other for Sunday. Tickets are available online and cost a fiver for each day – that covers a glass, a programme and your first half, then it's a fiver a pint. And no, I don't know if there's a refund on Sunday if you still have your glass from Saturday! The provision of proper toilets, at some of the outlets, is welcome news; especially to gentlemen of a certain age! Yes indeed, we just need more of the others to catch up now. Low-alcohol is the future – but for whom?